Savile Row at SavileRowCo.com designs and produces an extensive range of clothing and accessories for men and women - all crafted to the highest standard of quality and workmanship. By supplying direct from their own warehouse, Savile Row is able to minimise costs and pass these savings onto their customers. For Corporate trends and the new styles in men's suits check out Savile Row. Save even more by checking here on VoucherGurus.co.uk for the latest Savile Row discounts, Savile Row promotions and Savile Row vouchers. Sign-up for the Armed Forces Club membership and save an additional 12% from Savile Row. Click link to sign-up now. 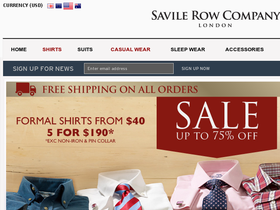 Save an additional 10% off everything from Savile Row with a Corporate Club Card. Click link to sign-up and start saving even more!